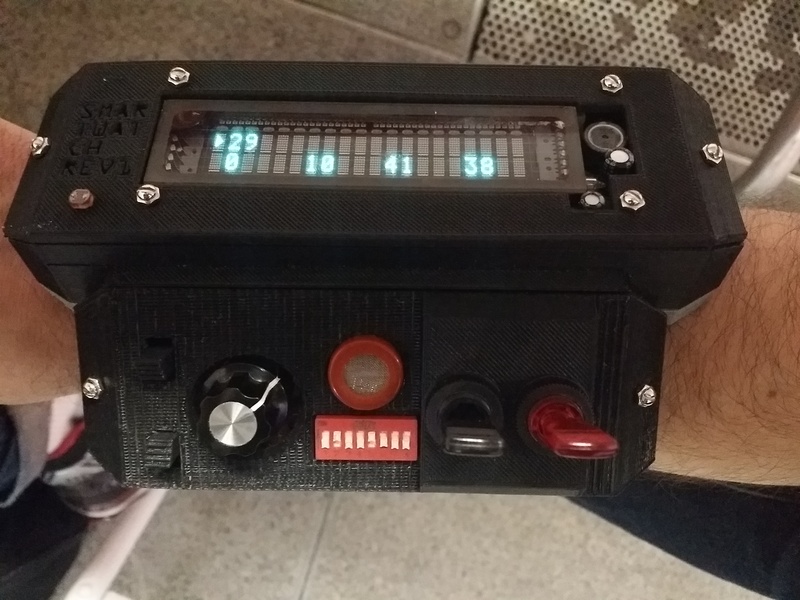 If you’ve met me in real life (or are visiting here from Hackaday) you’ve probably seen my SmarTwatCh. 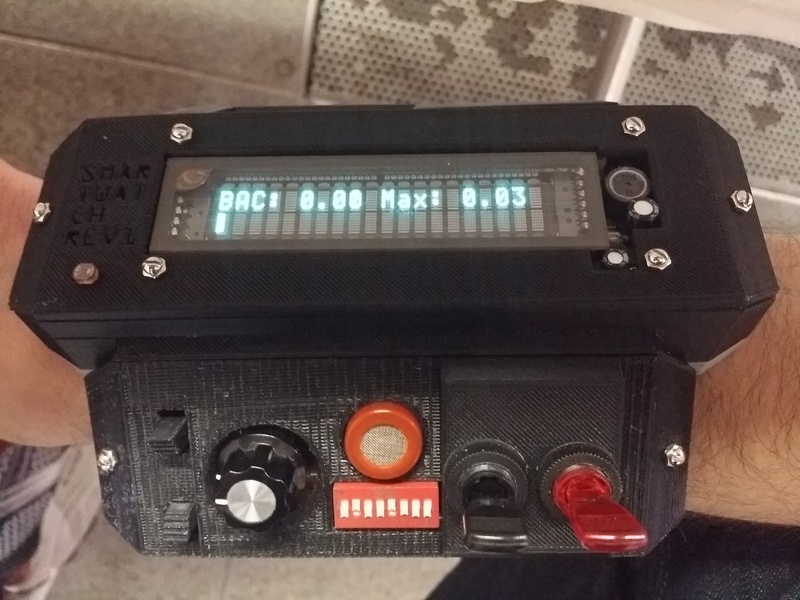 It’s 3D-printed, Arduino-based, has a breathalyzer, and is not subtle! 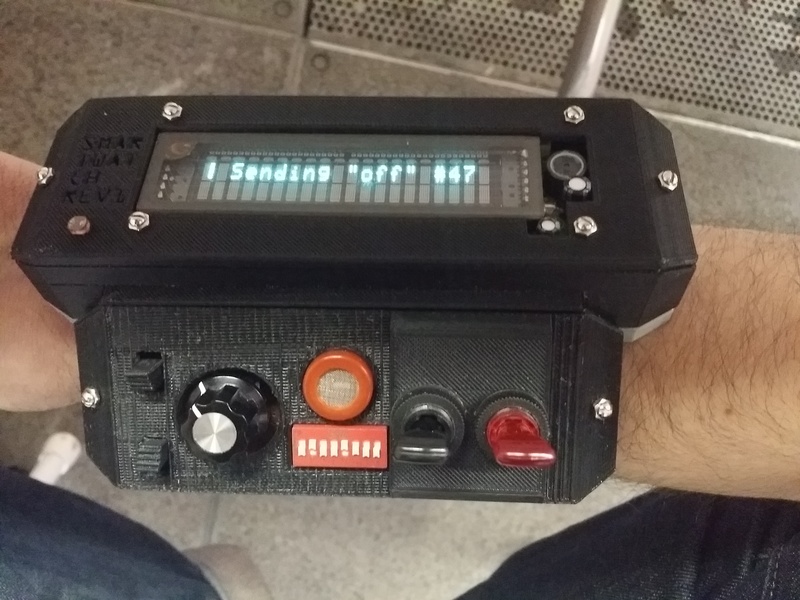 I built the SmarTwatCh to make a point about modern wearables – they’re too damn subtle. Why should smartwatches look like regular watches? Why should heads-up displays look like sunglasses? Cyborgs shouldn’t be afraid to step out of the closet and wear their tech on their sleeves. Literally. Like any smartwatch, the SmarTwatCh has lots of high-tech features. 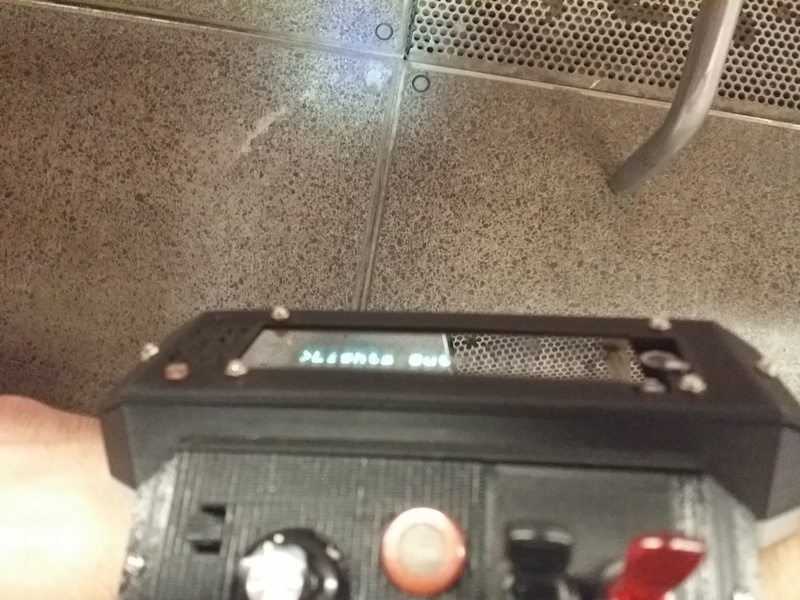 What wrist computer would be complete without showing your hit points? This one does Magic: The Gathering, the greatest card game of all time. Here’s the control panel. 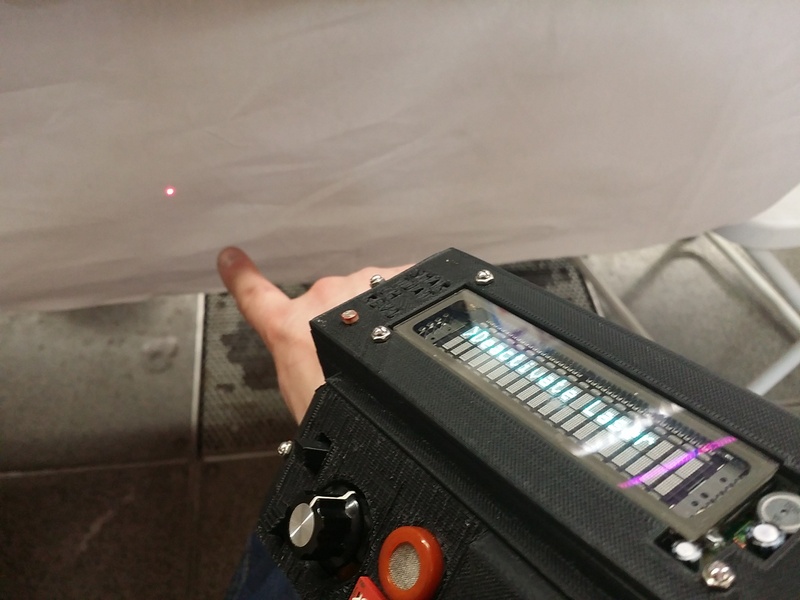 The black buttons are shortcuts to the laser and flashlight that also have special functions in the apps. The knob selects stuff for apps. The red mesh thing is the breathalyzer sensor. The DIP switches look awesome, but I can’t figure out what to do with them. The black switch turns the display on, and the red switch selects clock mode or app mode. They’re panel-mount and they have ultra-snappy tactile feedback. The back hatch flips open to reveal a stash box and direct access to the battery. 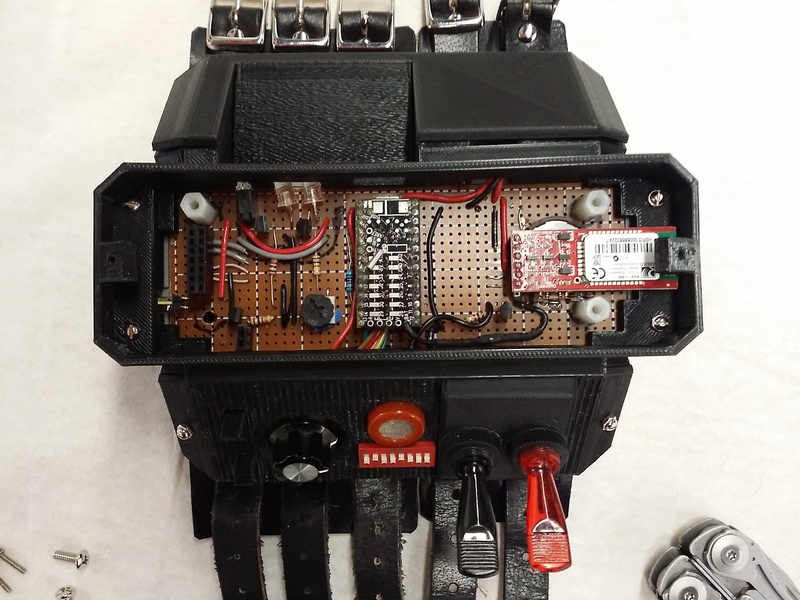 The battery is an 800mAh LiPo that runs through a charge controller and boost salvaged from a USB battery charger. 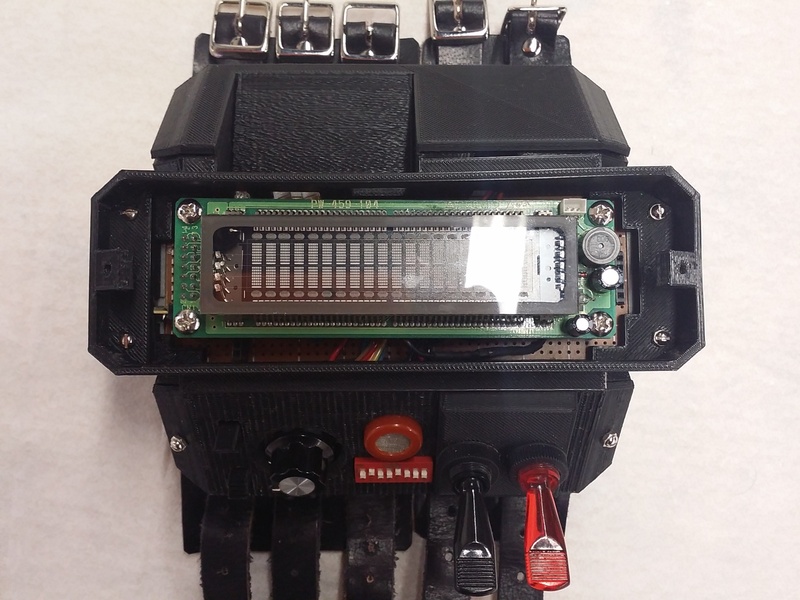 Taking off the front plate reveals the Noritake Itron 2×20 Hitachi-compatible VFD. It runs at 160V 60V and is an authentic glass vacuum unit, making it a hilariously dangerous choice for a wearable. I say it adds character. Beneath the VFD is the hand-soldered perfboarded circuit board. The brains are a Teensy 3.0 Arduino-compatible, with a RN-41 for future Bluetooth stuff. 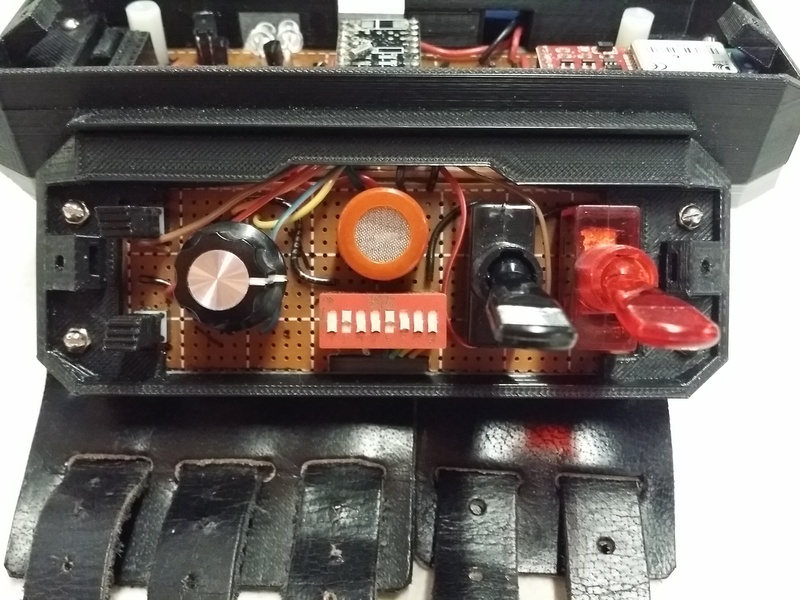 MOSFET’s drive the laser, flashlight LED’s, and infrared LED’s. That pot calibrates the breathalyzer. 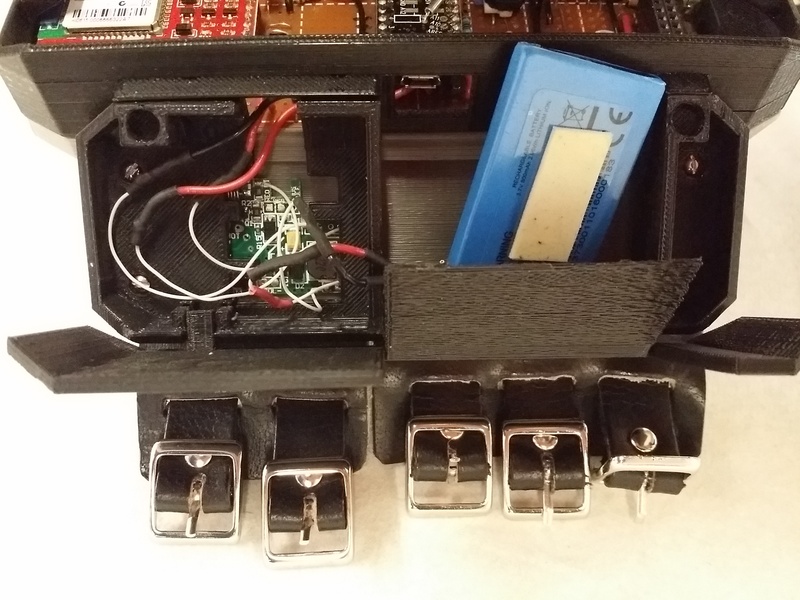 The electronics of this project were totally improvised and sloppy and there’s barely enough room to fit a single discrete. The case was printed on my Replicator 2 at low quality with PLA. It’s a great conversation piece to tell people about the magic of rapid automated manufacturing. It also looks pretty sweet. I’ll put the sketch and models online soon, though they won’t do much without my hacked-together circuit. What’s the the future of the project? 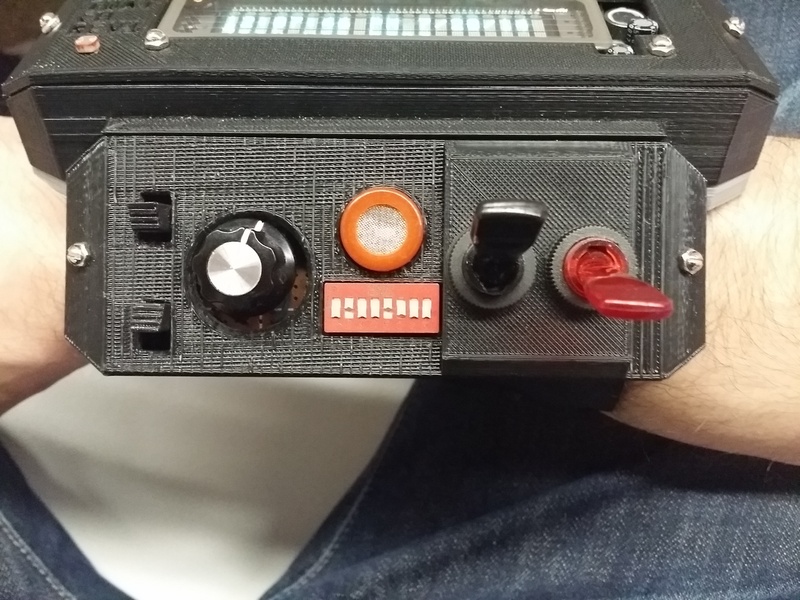 Maybe a wearable sampler/synth. Maybe a sensor platform. Maybe a control system. Who knows? The future is a weird place and I can only hope to make it weirder. Pingback: Is Your Wearable Tech Too Subtle? Hi. I guess you have a typo. The VFD display is running at 60 Volts, since it’s muxed. Not 160V, that would destroy it. Yup, fat-fingered that one. Thanks for the tip. where can I order it? I love it! A Synth could be awesome. Whats about an integrated mp3 player or an amplifier for small external boxes? A countdown, a chronometer and a klick-counter can be useful too. You can’t buy it! You can certainly use it as inspiration for your own projects. Will your future versions be waterproof? I feel that wearable technology should be able to withstand its host’s environment. 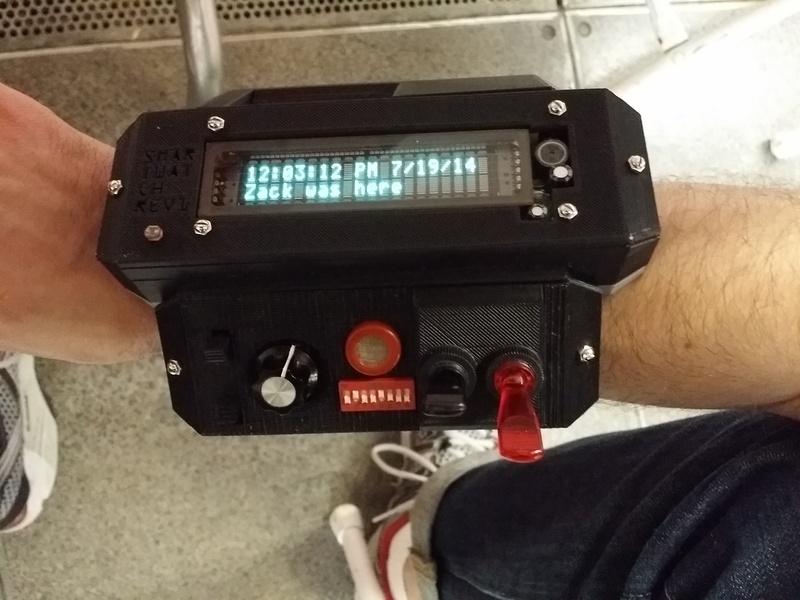 Super sick watch though I am learning how to solder right now by putting components into perfboard. Good question. 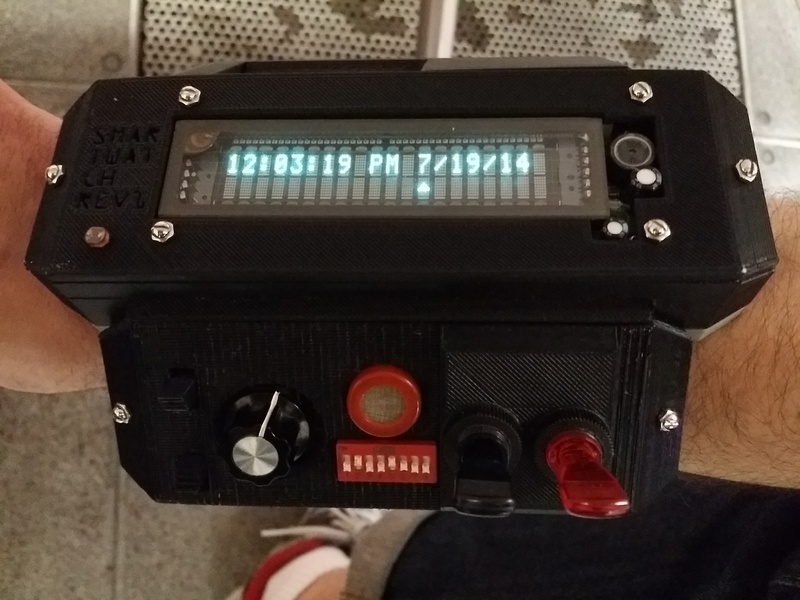 The SmarTwatCh is not watertight by design – the VFD and its drive circuitry creates a lot of heat, and I’m relying on convection to cool it off. The alcohol sensor needs airflow to operate, so I’d need to make some kind of gasketed cover or something. Also, the host’s environment is sitting at a workbench and/or drinking at a bar. Then it is very well engineered good sir. Also I would like to mention that you have inspired me. Hi Zack I love what you made!